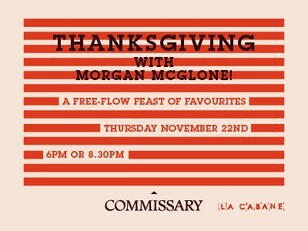 Off the back of last year's sold out dinner, the team at Commissary are thrilled to present another Thanksgiving feast, but this time cooked by celebrated chef, holiday enthusiast and owner of Australian based Belles Hot Chicken, Morgan McGlone. 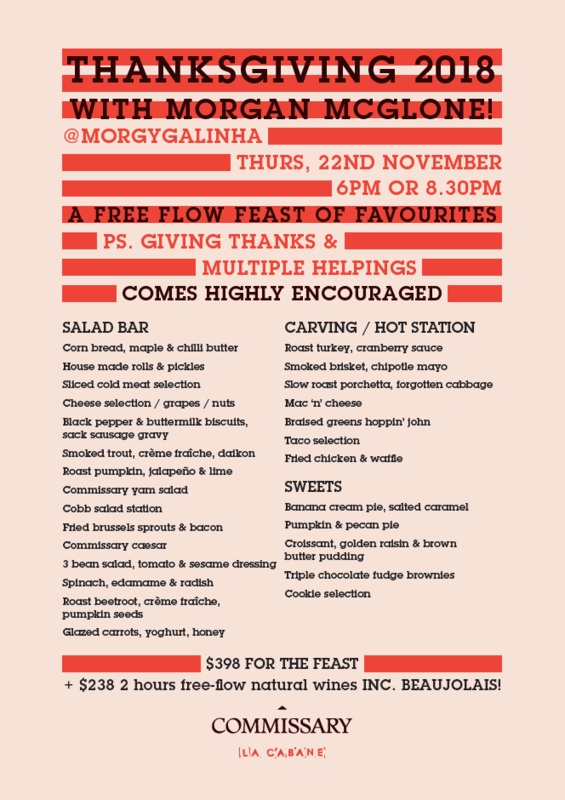 On Thursday November 22nd, guests can expect a banquet style spread of McGlone’s favourites featuring meats, sides, sweets and more - with giving thanks and multiple helpings come highly encouraged. They can opt in too for a free flow of natural wines including Beaujolais (!) care of the team from neighbourhood wine bistro, La Cabane. Thanksgiving will also fall on the eve of a 3 day take over from... BELLES HOT CHICKEN! McGlone's collection of Australian based, internationally celebrated shops where hot chicken, natural wine and damn good times reign. Morgan McGlone is a third generation chef who is first and foremost, a food nerd. His favourite book as a child was a cookbook and he would make various dishes from it for his family with his dad providing encouragement from the sidelines. Starting out at culinary institutions in Sydney including Summit and Luke Mangan’s CBD Salt Restaurants, Morgan moved on and headed to the States where started his own catering and chef agency in Los Angeles and New York. In 2008 he moved back to Sydney and opened his much-lauded French Bistro, Flinders Inn in 2009. That same year he co-founded the award winning hospitality young guns group, TOYS (Taste of Young Sydney). Moving back to the States, Morgan spent several years working for Sean Brock at Husk in South Carolina, and then as Chef de Cuisine at Husk, Nashville. In 2014 he returned to Australia to open Belles Hot Chicken. He continues to consult and appear at food festivals nationally and globally.